Ji S and Waterman D 2010 Production Technology and Trends in Movie Content: An Empirical Study, Working paper, Dept. of Telecommunications, Indiana University, December 2010. Given that the theory of national cinemas is as central to film studies as genre, it is also surprising that there have been no comparative studies looking at the box office performance of different genres in different countries. This post presents a quick and simple comparison of the top 50 films at the Australian, UK, ans US box office from 2008 to 2010, inclusive. The total sample is 150 films for each country, and these were divided into nine genres: action/adventure, comedy, crime/thriller, drama, family, fantasy/science fiction, horror, romance, and other (which is mostly musicals and concert films, but also includes war films, westerns, and documentaries). The box office data was collected from Box Office Mojo, and for ease of comparison all values are in US dollars and have been adjusted for inflation to 2010. Films were ranked according to their box office gross, with the highest grossing film given a rank of 1, the second highest a rank of 2, and so on. Tables 1 through 3 present the summary information for each country, including the number of films in each genre; the minimum, median, and maximum ranks of the box office grosses (no data is provided for very small classes); and the number of films from each genre in the top 10, top 25m top 50, and top 100 films. Four genres – action/adventure, comedy, family, and fantasy/science fiction – account for approximately 70% of all films in each country. The top 25 and top 50 films are almost entirely composed of only three of these genres. Comedy, despite accounting for such a large proportion of films in each sample perform poorly by comparison, and rarely make it into the top third grossing films. Only one comedy film in the UK and the US, and none in Australia, made it into the top 25. The majority of the top 10 grossing films over this period in the US are accounted for by action/adventure films, whereas the dominant genre in Australia and the UK is fantasy/science fiction. In the working paper referenced above, the thriller is described as one of the most popular genres at the US box office, but it is clear from this data that in recent years crime/thriller films are few and far between and perform substantially worse than the main four genres. These results do support the conclusion of the above paper that drama does not account for a significant proportion of the highest grossing films. Drama does appear to perform slightly worse in the UK compared to Australia and the US, with less than half the films to make it into the top 100. Horror accounts for only a handful of films, and these rank very lowly in the sample for each country. Romance films account for less than 10% of the films in each sample, but they do seem to perform well at the box office. All of the romance films in the Australian data made it into the top 100, and most of the films from this genre also achieved this result in the other two countries. 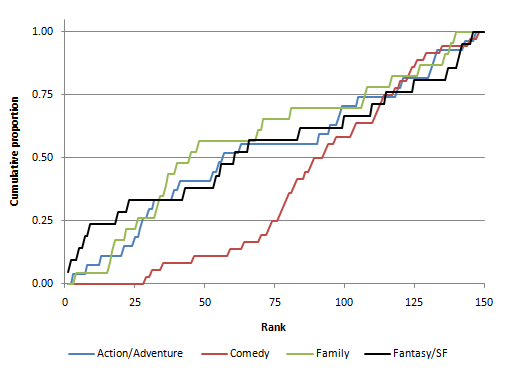 The differences in the rankings of the four major genres – action/adventure, comedy, family, and fantasy/science fiction – can be seen clearly if we plot the cumulative proportion of films less than or equal to a rank 𝑥 (Figures 1 through 3). In all cases, it is clear that comedy performs substantially less well than the other three genres. Even though this is one of the most common genres, but it tends to rank much lower that the other genres. This does not necessarily mean that comedy are less profitable – the lower budgets for these films relative to special effects-heavy films of the other genres means that even though they tend to gross less they can still make their money. On the other, it may suggest that the market is saturated with comedy films and that too many films are chasing too small an audience. I am unaware of any research on this topic. 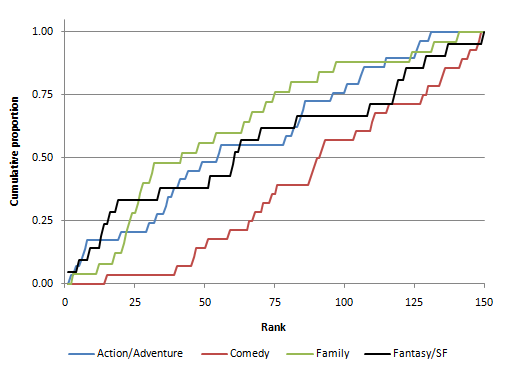 In Figure 3, we can see the high grossing action/adventure films that account for 5 of the top 10 films, whereas in Figures 1 and 2 this genre is not so dominant among the upper rankings. Fantasy/science fiction films occupy a high proportion of the highest grossing films in all three countries; Family films appear to do slightly less well at the high-end and slightly better at the low-end, but are concentrated more in the middle relative to these other genres. 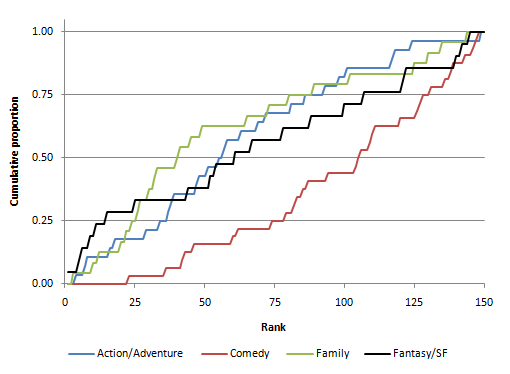 The four curves appear to converge where the rank is approximately 120, indicating that these genres are relatively evenly distributed at the end of the rankings. This does not appear to be the case for the other two graphs, where comedy remains distinct from the other genres. Overall, we get the same patterns for audiences and their box office preferences irrespective of whether they live in Australia, the UK, or the US. Undoubtedly, this is in part attributable to the ability of global media empires such as Buena Vista International, Time-Warner, News Corporation, Viacom, etc. to shape a market. Although limited, the above results raise an interesting question regarding the nature of national cinemas: if the film markets in different countries are so similar does it make any sense to speak of discrete national cinemas rather than a single global cinema? The fact that Australia, the UK, and the US are all culturally similar, English-speaking countries may contribute to the effects noted above, and we may find that in other countries, where the main language is not English, that different patterns emerge. However, I am sceptical on this point, and as soon as I have got some data to make the comparison I will post a follow-up. Over the past few weeks Jim Barratt has added two posts to his blog Bigger Picture Research, in which he asked the question ‘What Do We Need to Know?’ This discussion was prompted by the impending demise of the UK Film Council (UKFC) and the lack of clarity regarding the future collection and dissemination of statistics on the British film industry under the new British Film Institute (BFI). The first post, which invited comments from those working in the film industry, can be accessed here. The second post, which features the comments of academic contributors (including myself), can be accessed here. What do we need to know? That is the question I put to a number of film industry insiders, analysts, academics and interested observers over the last few weeks. As worded, the question implies some degree of empirical evidence is necessary to the film business and the state apparatus that supports it, though I was quite prepared to hear from people who felt the contrary was true. Of course, nobody did. In fact, everyone I approached was clear that research and statistics are essential in one form or another, as a means to a variety of ends. To follow up, this week’s post lists some possible sources of information that may be of use to researchers interested in film industries in general and the UK film industry in particular. Compendium is a website produced by the Council of Europe and the European Institute for Comparative Cultural Research, which has been running in various forms since the late-1990s. It monitors cultural policies in 42 European nations, from Armenia and Azerbaijan to Ireland and the Holy See, and provides summaries of the cultural policies in each country, statistics on specific cultural activities, and a themed section which looks at different aspects of cultural policy (cultural diversity, the status of artists, etc). One part of the website is designed specifically to make it easier to compare different European countries alongside one another. It also has sections on statistical methodology and the use of statistics in cultural policy making. Compare ticket prices for Avatar across Europe – it was cheaper to see Avatar in Armenia (€2 – 2.5) than in the UK (€5.89), but it was more expensive in Azerbaijan (€7.3). Drawbacks with Compendium include the fact that it lacks up to date information for some measures – for example, there is no information on the market share of feature films after 2007. A further problem is that some of the information available from Compendium is produced by other bodies such as the European Audiovisual Observatory (here), which will typically be more up to date and more detailed. An advantage is that you don’t have to spend hundreds of Euros to get the information as you with the EAO Yearbook. What is available is from Compendium is attractively presented, well organised and searchable, and the ability to make simple comparisons is very useful – you just wish it would do more. Compendium can be accessed here. There are obviously lots of national bodies collecting data about their respective film industries, and it would be redundant to go through each and everyone, but it is useful to take New Zealand as an example (and Australia below) and to look at some the practices there that I would like to see imported into the UK. The New Zealand Film Commission (NZFC) The NZFC provides a list of all the feature films produced in New Zealand from 1939 to 2009. There is also a complete list of projects funded by the NZFC and the level of investment from the commission from 1990 to 2009. However, the NZFC does not provide statistics on the film industry in New Zealand in general, and responsibility for this lies with the national statistics agency. The Statistics New Zealand site for film can be accessed here. Statistics New Zealand fulfils a role similar to that of the UKFC in providing data on the film industry, where as the data collected by the NZFC is limited to its own activities. What I really like about the Statistics New Zealand survey is that it gives you detail on how and where money as spent. You can find out what proportion of post-production revenue was received by contractors working on editing, captioning and subtitling relative to digital effects; and what proportion of production investment was spent in Wellington, Auckland, the rest if New Zealand, and beyond. There is even a report specifically given over to the regional data for the film and television sectors. It also gives details on the methodology behind the survey, which has been lacking from the UKFC. One issue that was not addressed by the discussion on Bigger Picture Research was the role of the Office of National Statistics (ONS) in providing either data, summaries, or methodological support for bodies such as the UKFC and BFI. Indeed, as far as I have been able to tell, there has been very little attention paid to the framework for collecting, analysing and distributing statistics on the UK film industry, even though the ONS has precisely this sort of expertise. There is a lesson to be leant here from the role played by Statistics New Zealand. However, this should not lead to the situation in New Zealand where little information is produced or distributed directly from the national film body (NZFC or BFI) – rather, it is a case of utilising the expertise that already exists. The UNESCO Framework for Cultural Statistics can be accessed here, and is another source (along with the methodological resources at Compendium and the ONS) that can serve as a basis for determining why, what, and how data on the film industry in the UK is collected. In my contribution to Bigger Picture Research, I criticised the trade bodies in the UK for failing to take the provision of relevant data seriously. If you want to see how it could be done, then the website of the Motion Picture Distributors’ Association is a good place to start. Rather than simply telling us how the top 10 films performed at the box office, you can find data on all the films submitted to the NZ box office. All of this information can be downloaded freely as Excel files, and the available data goes back to 2006. Other parts of the website are less well-developed, but there is no excuse for British trade bodies for not doing the same in the UK. The Motion Picture Distributors’ Association can be accessed here. Screen Australia make a substantial commitment to this area: in 2011 there is up to AS$150,000 available in funding for researchers. Not all the assistance given will be financial: Screen Australia will help you to do the research by providing access to data. They actively encourage data-sharing. Last year’s awards went to academics and to companies from the film industry, thereby bridging that divide. They also invested heavily in publications and new technologies to further the development and circulation of information on the film industry. The projects supported are intended to further the policy aims of Screen Australia by finding out what they need to know and making that information available, and this puts research right at the heart of what Screen Australia is trying to do. In contrast, in the UK researchers are often excluded from data collection and analysis because it is either too expensive or in the hands of civil servants or private companies. Details on Screen Australia’s programme can be accessed here. The new BFI will be responsible for both education and industry in the film sector in the UK, and I think that it would be a very good thing if these two areas of responsibility could be linked together in a manner similar to that of Screen Australia. This makes excellent economic sense for the film industry: if you give your data away for free, then you will find that economists, sociologists, film scholars, and bloggers with nothing better to do will analyse it for you simply because that is what they do. This is much cheaper than commissioning reports from companies that put their results behind ridiculously expensive paywalls. If the industry gave away its data for free then it would receive in return a massive subsidy for research via universities and research councils around the world. Anything the new BFI can do to facilitate this – by encouraging the industry to make data available and by supporting researchers as they do in Australia – should be at the forefront of its thinking. The attitude of openness is one that could certainly be encouraged in the UK film industry. (Note that I have often referred to the availability of data as a problem rather than the availability of statistics – statistics are summaries of data [e.g. the mean and the standard deviation are statistics that describe a data set]. We need statistics to understand data, but without the data we can do nothing). Finally, a report on the cultural industries in South Africa – which can be accessed here – that is interesting for two reasons. First, it is difficult enough to find anything about film industries in Africa, and this report provides detail on the film industry in South Africa in the early 2000s and is therefore interesting in its own right. Second, it is interesting to note that the South African government was looking to other countries – Canada and the UK are cited prominently – for inspiration in assessing the state and impact of the cultural industries. The cultural mapping projects of the Department of Culture, Media, and Sport (DCMS) are cited as notable examples of how this may be achieved. The way in which the coalition government has gone about the reform of the UK Film Council and the BFI lends itself easily to pessimism that could easily have been avoided if this process had been done properly in the open. The points made on Bigger Picture Research are all valid, but we should understand them within the broader context of a framework for researching the cultural industries that has developed over the past decade and a half. It is worth noting that progress in data gathering and analysis (of which the UK Film Council has been a part) has been made since 1997, and that other countries around the world have looked to the UK for ways of doing this themselves. The UK Film Council made great strides in the provision of information, especially when compared to the utter lack of a cultural policies framework in the 1980s and 1990s. It is unthinkable that all this progress would be lost – but the reform of the BFI is an opportunity to go further and do more, and it is disconcerting that there has been so little debate on this topic. But if you do want to contribute then get over to Bigger Picture Research, where you will find much to stimulate your mind.